On some weekends, when you wake up, the first thing that you want to do is just go to the sea, put your kayak in and start kayaking. It is a wonderful and liberating feeling, especially if you have had a rough week. But, if you live far from the water, racking your kayak to the roof of your car and taking it off, takes a lot of the fun out of going kayaking. And if the distance from your home to the sea is a lot, it gets even more stressful. Also, if you have multiple kayaks and would like to go with your whole family kayaking, it adds to the complexity of the problem. In such a scenario, having a Kayak trailer is the perfect solution. Regardless of your level of expertise when it comes to Kayaking, carrying a kayak is difficult and worrisome. Having a kayak trailer eases your mind of the worry of transporting it. You will go kayaking more frequently if you know you don’t have to worry about transporting the kayak on your car, etc. Kayak trailers are very popular if you have a large family or a large group of friends who go kayaking. It is also useful for summer camps and scout camps. There are many excellent Kayak trailers in the market and we will help you to choose the one that is perfect for you. Let’s get started. How Many Kayaks can it take? What is the Size of the Trailer Tongue? What is the Tire/ Wheel Size? There are a few criteria you should consider before purchasing a kayak trailer. 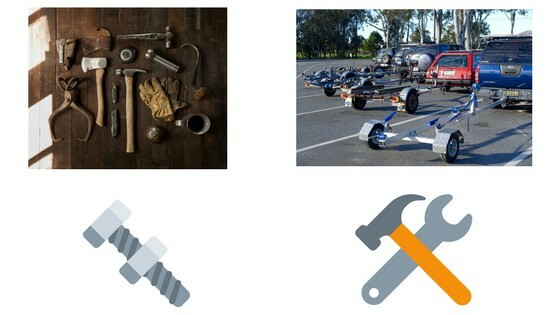 It is important that you consider these before purchasing your kayak trailer as returning one, especially online can be a bit of a tough go and most importantly expensive. How Many Kayaks Can it take. Typically most kayak trailers have a capacity of around two to four different kayaks at a time. The manufacturer should have a recommendation and a maximum capacity rating for the trailer. This criteria alone will give you a better idea for what you need. Some of these trailers can potentially be used as multi purpose transportation for other things such as paddle boards, bikes, canoes or even boats depending on it’s capacity. If you are running a kayak rental location than it is best to look for a trailer that can take on more kayaks with a higher maximum capacity so you don’t have to keep transporting them back and forth and make multiple trips. The size of the trailer tongue is the distance between the axle and the hitch. Why does this matter? It matters because it determines what type of trailer to get in conjunction to the size of kayak you have. If you have a longer Sea Kayak or even a tandem you will want a longer trailer tongue length. On the contrary if you have a shorter kayak like a recreational sized yak then you can get away with a shorter tongue length. Also consider that the longer the kayak/ trailer the harder it will be to back up in a straight line. This will be the difference in paying more or less for your kayak trailer. If you are not mechanically inclined then you should just either buy a model that is already assembled or pay someone who is mechanically inclined to assemble it for you (Perhaps invite Handyman Bill over and get him a six pack!). The dangers of not being mechanically inclined and assembling you kayak trailer without help could become a hazard on the road. Sometimes all it takes is a loose nut or no bold and then you could have your problems amplified ten fold. This is heightened when you go onto the highway and reach speeds of 60 MPH or more. You may also require some oddly shaped tools that could end up costing you more than you wanted to spend so in many cases it may just be more worth it to spend the extra hundred or so and get it premade. Tire and wheel size determines how far off the ground your kayak will be and what kind of terrain you will be able to go over. As a rule of thumb it is best to look for a trailer that has bigger wheels as it will go over many different types of terrain more easily and the tires will last longer. While smaller wheels do end up costing less in the beginning they are harder to find replacements for and will not have as long of a lifeline as larger tires. In some cases smaller wheels can also put more stress on the berrings. To insure the longevity of your kayak trailers it is a good idea to have it under some shelter such as a garage or even some sort of temporary canopy. I’ve had experience in the past where after a trailer has been in the rain for too long parts of it start rusting which is not good for longevity. Even though all of these trailers are galvanized to protect against weather it will still increase it’s longevity if you keep your kayak trailer under some sort of shelter. If you have up to 4 kayaks that you want to transport, the Malone MicroSport is the best kayak trailer for you. You can assemble it very easily. It comes with very clear instructions. It is strong and corrosion resistant as it has a galvanized steel frame. It can carry kayaks that are up to 18 feet long. This helps it to carry most kayaks or canoes. It has a capacity to carry a weight of 355 pounds. It has a total length of 159 inches and width of 65 inches. Capacity: It has a capacity to carry up to 4 kayaks comfortably with a total weight of 355 pounds. Strong and lightweight: It has a steel frame which is galvanized that makes it strong but it also has a body of aluminum that keeps it lightweight and easy to transport. 65 inch wide crossbars: The crossbars make it well-matched with most of the car rack accessories. Malone Brand: Coming from the Malone brand, the Malone MicroSport is a reputable kayak trailer and you can be assured of its quality. 1. Price: The Malone MicroSport has almost all the features that the next kayak we review has, but has a higher price. The Malone MicroSport is an excellent Kayak. It is wide and long enough for most kayaks and canoes. It can carry a fair amount of weight and up to 4 kayaks. It is strong and yet lightweight. If you want a strong kayak from a reputed brand, then the Malone MicroSport Kayak Base Trailer is the one for you. The thing I like best about the Ruff-Sport Kayak Trailer is that it is versatile. You can use it to carry a lot of things on to this trailer like bikes, canoes, surfboards,kayaks and tandem kayaks and even camping gear for a camping trip. It has great value for money but can carry only two kayaks comfortably. It has a length of 11.5 feet and is 64 inches wide. You can very comfortably carry 2 bicycles and 2 kayaks in it. Versatile: The thing I like best about this trailer is that your imagination is the limit to what you can pack up on this trailer. It is versatile in what you can carry and can comfortably include bicycles to canoes to kayaks. Strength and lightweight: The Ruff-Sport Kayak Trailer has a galvanized steel structure which makes it strong and is great to use in salty environments as it does not corrode. The body is made of aluminum which makes it lightweight. Capacity: Though you can carry a lot of different things, it can carry only up to 2 kayaks comfortably. So if you need a kayak trailer which would have to carry more than 2 kayaks, this isn’t the one for you. No padded crossbars: The Ruff-Sport trailer does not have padded crossbars. You would need to buy them separately which adds to the cost. The Ruff-Sport Kayak Trailer is an excellent choice if you need a best kayak trailer for up to 2 kayaks. It is also great if you want to use your trailer for bikes, paddle boards surfboards or bicycles. It has great quality and comes at a good price. If you want a hassle-free, high-quality kayak trailer with a capacity for carrying two kayaks, then the Malone XTRALIGHT Trailer Package is the perfect trailer for you. It is from the reputed Malone brand, it is lightweight and extremely easy to assemble. Easy to use and assemble: The trailer is easy to use as it is specifically for attaching and transporting kayaks. It has dedicated built-in kayak racks. Ratchet straps: The trailer comes with ratchet straps which make sure that your kayaks are strapped in safely and won’t fall off. Five-year warranty: The Malone XTRALIGHT Trailer Package has a five-year warranty and is manufactured in the United States which gives you the assurance that it is a reliable product. 1. Drive carefully: Since the trailer is a lightweight one, you need to be careful while driving as it could jostle and bounce on rough roads if you drive fast. The Malone XTRALIGHT Trailer Package is the best kayak trailer if you want a two kayak trailer. The trailer is strong, dependable, lightweight and worry-free. You are assured of a quality product with the Malone XTRALIGHT Trailer Package. I hope this list of quick reviews was helpful to you to find the best kayak trailer for your needs. In case you want to recommend a trailer that I did not include, please do let me know. Have a great time kayaking!